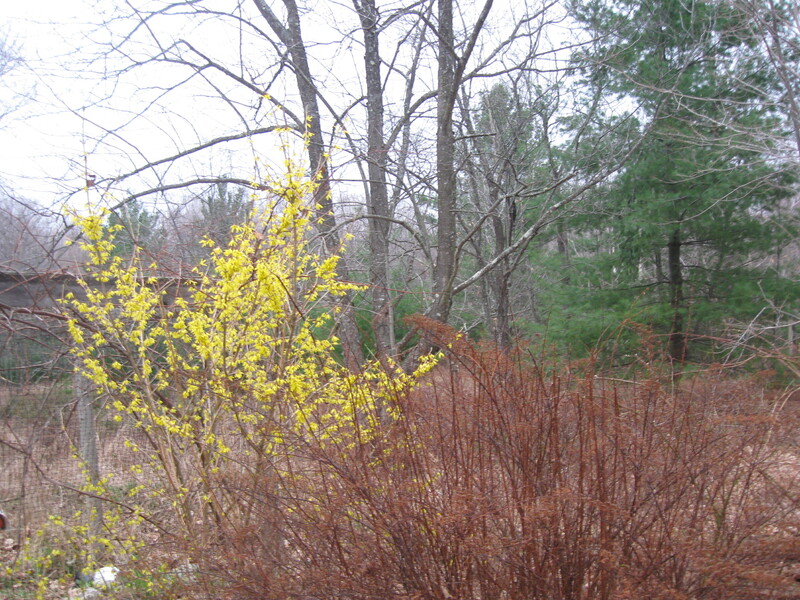 Spring, at my house on Beaver Island, is a busy time. There is a narrow window of opportunity – between the snow melt and biting black fly season – to get everything possible done in the gardens. I realize now, after a few free days that could have been dedicated exclusively to yard work, time is not the only problem! I’m no longer able to spend six to eight hours on my hands and knees tending flower beds. I cannot spend three hours with a shovel and a wheelbarrow, double digging each of my raised vegetable beds. How did I ever do it? I can’t do it anymore. I’m aiming for one hour a day, every single day. The temperatures have dropped again. Yesterday I worked outside in my parka and knit gloves! 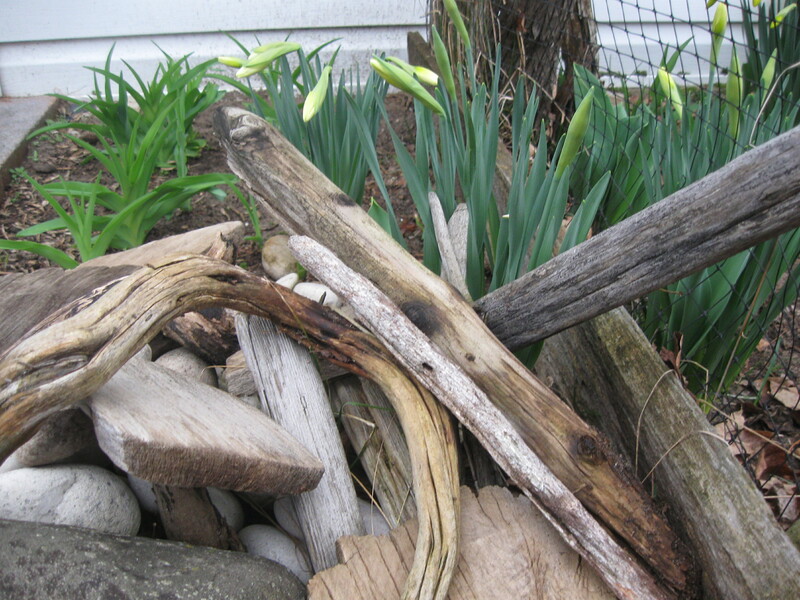 I managed to remove leaves and pine needles from a bed of daffodils. That always reveals weeds and grass that have taken hold under the debris, so I dealt with that, too. A blazer is nice to throw on this time of year, as a jacket. They usually have good pockets (always handy) and add a touch of class to whatever else I’m wearing. I’ve had a couple blazers that I purchased new, but I’ve also gotten a lot of good use out of some that have come to me in other ways. About twenty years ago, my friend, Chris, and I stopped into the Re-Sale Shop here on Beaver Island. The Re-Sale Shop was still in its old location, in the old Livery building. Chris was looking for rags, for her husband’s garage. I was just keeping her company. My daughter, Kate, could spend twenty minutes and two dollars there, and come out looking like a million bucks. I could spend a lot more, and would look like I’d dressed out of the rag-bag. I just didn’t have the knack for it. On this day, however, someone had just dropped off a pile of suits. I bought three jackets: two in different shades of gray with a very subtle stripe, one in a nice tan tweed. I still have them, and still get compliments whenever I wear them! The blazer pictured here is not one of the new ones, nor one of the treasures found at the Re-Sale Shop. It is one that my daughter, Jen, bought…new…a long time ago…when this look was stylish. She gave it to me more than ten years ago. It’s obviously seen a bit of wear. It has snags and tears from being worn on my walks through blackberry brambles. The elbows are worn; the lining is torn. 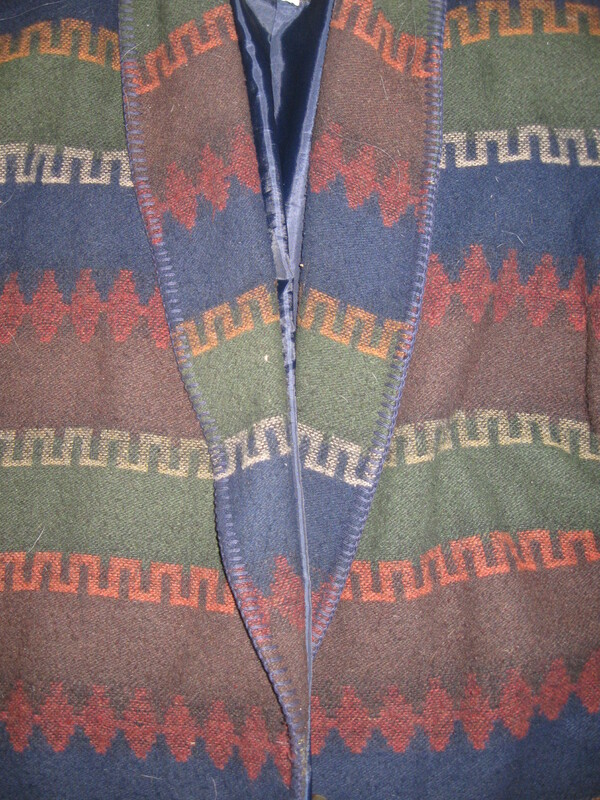 Still, it’s a nice jacket to throw on as an extra layer, when looks don’t matter. Turns out, it still manages to dress up a look, in a pinch. Last Sunday, I had a ten o’clock flight scheduled, to go to the mainland for the day, to visit my aunt in the hospital. I had planned ahead so that it would be a stress-free day. Then I overslept. Eight o’clock, Sunday morning. I had to make coffee, shower, dress, and walk my dogs. I had to leave myself enough time to stop at the farmhouse to pick up several books and a robe for Aunt Katie, and the keys to the mainland car. I’d promised her I’d also take her dog out for a walk while I was there. I had to be at the airport by 9:30! Okay, I started the coffee brewing. If I was going to fit everything in, I had to walk my dogs right away. I was in my pajamas. The dogs didn’t mind. We took the path through the field to the logging road, then crossed Fox Lake Road to Cotter’s trail. We walked the half-mile down to the cabin, then circled around by the pole barns, then on the trail through the woods to the new Murray place, and back out to Fox Lake Road to head back to my house. I was almost home when I heard the car. I checked to make sure Clover was off the road, and swooped Rosa Parks up into my arms. Dogs safe, I then remembered how I was dressed. Brown jersey pajama bottoms, sagging at the fanny, bagging at the knees; pink flowered T-shirt top; navy blue and gray argyle socks pulled up over the cuffs of the pajama bottoms; red and black slip-on Hush Puppies. And the blazer. I hadn’t brushed my hair; I hadn’t brushed my teeth. There was no place to hide. It certainly seems like Spring here on Beaver Island! After a winter that was hardly a winter at all, we’ve now had several days in a row of unseasonably warm weather. Hovering near 70 degrees! I remember years when St. Patrick’s Day was celebrated with a foot or more of snow on the ground. Today I worked outside in short sleeves! My cherry trees have little nubs pushing out where the buds will be. 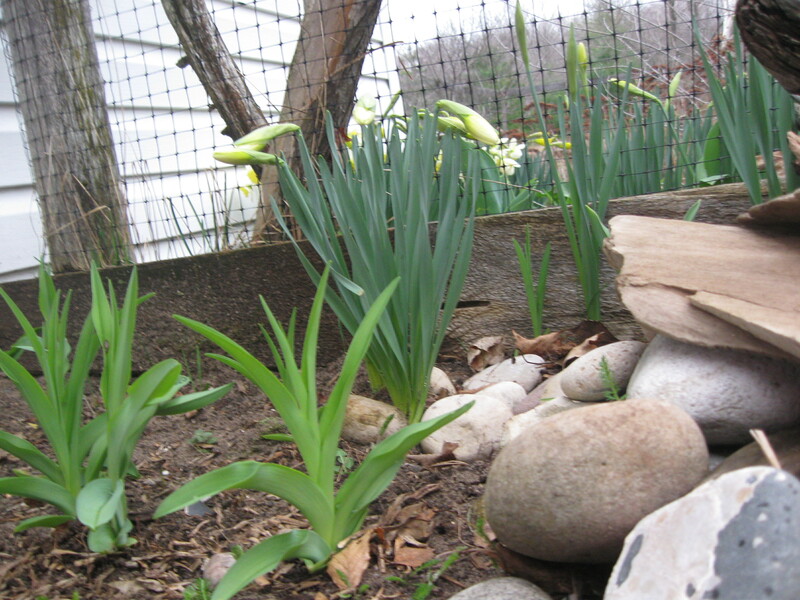 Daffodils, jonquils, early tulips and even day lilies are poking up their leaves in my flower beds. 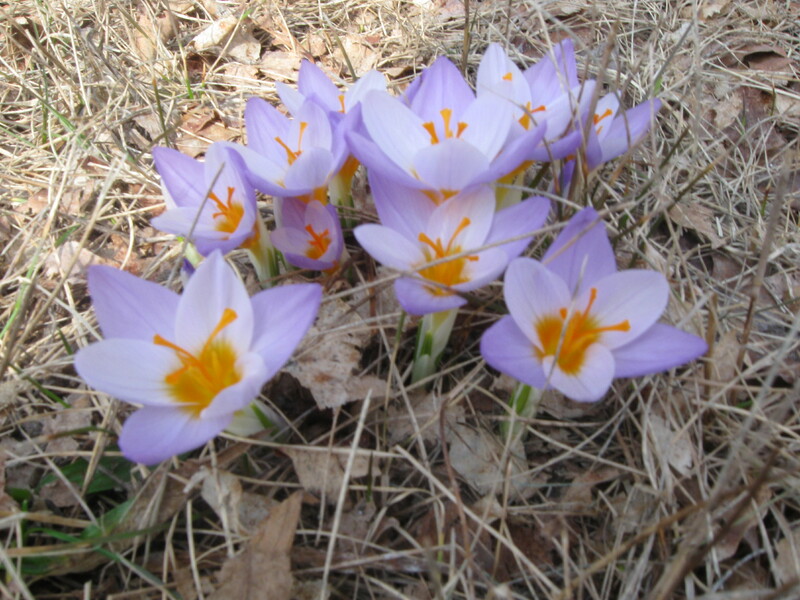 I found this cluster of crocus in a sunny spot in the front yard, not far from a patch of snow. The dogs believe that Spring is here. The melting snow opens up a world of new smells for them to explore. The warm weather brings out the chipmunks and squirrels to tease them. Just two weeks ago we had almost eighteen inches of new snow. Walks were slow-going, plodding and slippery affairs. Rosa Parks, pushing through heavy snow up to her chest, would sometimes give up and need to be carried. These warm days, though, she never slows down. She bounds through the fields and down the trails, circling every juniper and climbing every bank. Clover doesn’t even try to match her pace. Their tails never stop wagging! Home from the walk, I tore into some yard work. After a year of neglect, a season under wraps and a month of high winds, everything needs attention. I picked up branches and twigs, and added them to the fire pit…waiting for a calm day to have a bonfire. I raked the leaves and cleared the weeds out of the two small flower beds on the south side of the house. I set up the lawn chairs. I put away the snow shovel (I don’t believe Spring is here to stay, but I do believe I’ll manage now without the snow shovel). I hear warnings that the trees will bud too soon with all this warmth, and a killer frost will wreak havoc and the harvest will be ruined for the growers that depend on it. I hear that the danger of wildfires will be extremely high with the mild winter followed by such warm weather. I hear the lake levels will be down, with all of the devastation that brings, because of so little snow. And of course, Global Warming looms, a danger to all life. Should I hate this Spring day? Do I make any of this worse, by loving the weather? I don’t think so. Since the weather will do what it will do, I intend to thoroughly enjoy this beautiful, serendipitous day! Bill and I have been friends for more than 25 years. We used to have coffee together nearly every day. A natural story-teller and a wonderful teacher, he has helped me with dozens of projects and taught me a million things. I am saddened by his death, and will miss him always. We definitely had a connection. And that thought makes me smile today. My sister Sheila, who died unexpectedly last August, would have turned 56 years old on the 1st of March. Sheila was born in a leap year, barely missing making her appearance on February 29th. This leap year, all of the remaining sisters were together on Sheila’s birthday. We’re a large group; 14 years separate the oldest and the youngest in our family. That’s practically a generation! We are each unique, and different in many ways from our siblings. On the surface, looking at our lifestyles, politics, careers and interests, it sometimes seems surprising that we all grew up in the same household. Within that household, we all formed different bonds with our brothers and sisters. 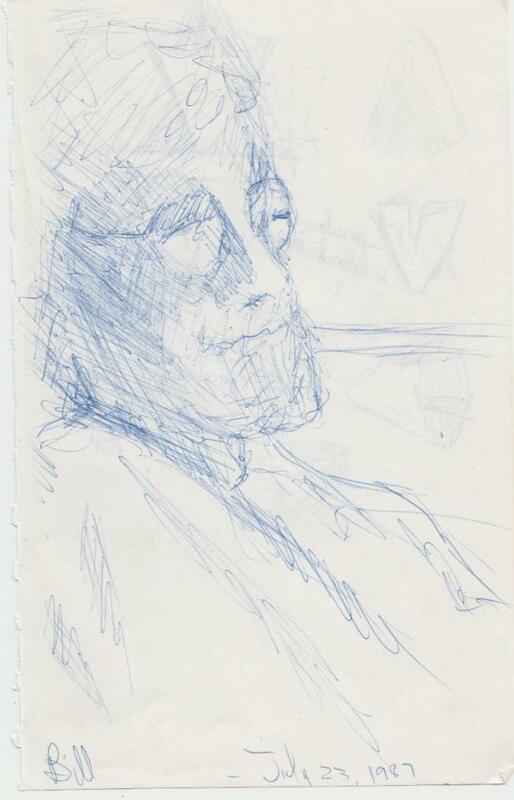 Each of us carries individual memories of Sheila, based on our own relationship with her. We all loved her. We all miss her. This year – with laughter and tears and lots of good memories – she was a part of our happy time together. I told myself I’d publish one essay a week. From years of experience, I know better than to set my sights too high. Lists are easy for me. Charts are a breeze. I excel at the planning stages of any endeavor. It’s the follow-through that kills me. So, one post a week, usually on Sunday. Maybe an extra one here and there for a special event, but no pressure. And here I am, less than three months in, already off track. I have a good reason for my neglect: I took a vacation! Six sisters, having survived one of the worst years of our lives, convened in Florida to celebrate our survival, our precious lives and our constant love and respect for each other. We laughed and cried and walked and played together. We relived old memories and made lots of new ones. We loved the sand, the sun, the water, and each others company. We filled every single day with wonderful experiences! It was a time to catch up with each other, and a time to catch our breath. It was healthy and healing and just plain fun! I was away from my computer for ten days, from Friday through the following Sunday. During that time, six of us shared one computer. Two of the six were handling business issues via the internet; one of the six was looking for housing and employment; all of us were using the computer to keep up with family back home. So, here I am, off-track, but still glowing from the experience! In order from oldest to youngest (as we have posed for pictures all of our lives! 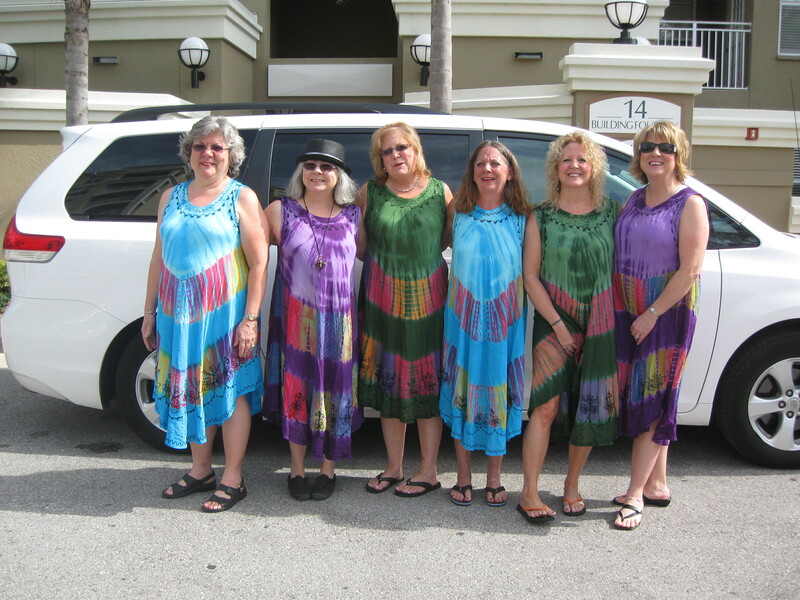 ), my sisters and I: from the left, Brenda, Cindy, Cheryl, Nita, Robin and Amy.